Conversion to Christ is an ongoing process. No one is perfect. Christ builds the bridge and calls us to be reconciled with God, to live in the community of the Church in peace and love. 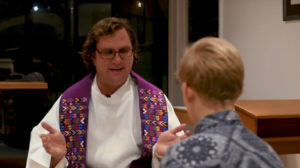 There are many opportunities to respond to the reconciling work of Christ – the Eucharist reconciles us with God and one another; Lent is a time of repentance or turning back; and many prayers ask for God’s forgiveness. The Catholic Church has a special sacrament as well, the sacrament of penance which comprises a rite of reconciliation. This sacrament renews the first conversion of baptism and restores the ruptured relationship with God and others. It reconciles the sinner to the communion of the Eucharist. Opportunities to celebrate this sacrament are offered weekly at Jubilee Parish. Introducing children to the greatness of God’s mercy in the Sacrament of Penance is a two-step process. A simple celebration of the second rite of the Sacrament is included as part of the preparation for first communion. In the year when the children turn ten (Year Five), they are prepared to celebrate more fully the Sacrament of Penance with individual confession and absolution (the first rite). This builds on the work of the previous year as they take the second step and learn in greater detail what it means to examine their conscience. This is the sacramental policy of the Archdiocese of Brisbane. For a copy of the diocesan policy, see Sacramental Policy of the Archdiocese of Brisbane. In Jubilee Parish, children are introduced to the first rite of the sacrament of penance before Easter so that the sacramental preparation corresponds with the penitential season of Lent. The time of preparation begins with a parents’ information session at the beginning of Lent. ​To inquire about Penance or to register for sacramental preparation, parishioners are invited to contact the parish office. For background on the Catholic Sacraments of Initiation visit the Flame of Faith website here.